When I first heard of the new Ronald D. Moore show, Helix, my eyes lit up with fervor and anticipation. I caught onto his previous series, Battlestar Galactica, after much of the initial craze had died down (with a proper binge watch on Netflix). Being a Moore fan, and with the lack of “true sci-fi” on SyFy these days, I welcomed Helix with open arms. However, I soon discovered that Helix was only being produced by Moore – not written or created by – a misleading fact in the show’s marketing spots. Unfortunately, that’s perhaps the show’s biggest problem. The writing is clunky, downright corny, and sometimes painful. Many characters suffer from an overwhelming flatness that makes me cringe every time one of them appears on screen. Even Billy Campbell, who I loved from his stint on AMC’s The Killing, can’t do much with a script that has him jumping from one plot point to another while delivering thick exposition along the way. Despite the many flaws, I’m still invested. Perhaps I’m a glutton for punishment or maybe I just want to see how it all ends. While not the weakest debut, Helix quickly sank to the bottom of the pack in terms of week-to-week ratings. Bottoming out in episode five, Helix has rebounded slightly and started leveling off, but is it enough to warrant a second season? Looking historically at these shows, Face Off debuted with the lowest numbers but grew steadily (its smaller reality show budget also ensures more profitability for the network). Battlestar faced low ratings to 1.1 million viewers in its season 3, and season 4 would soon be its last. The same holds true for Warehouse 13, which recently dropped to 1.3 million and has announced its end date. 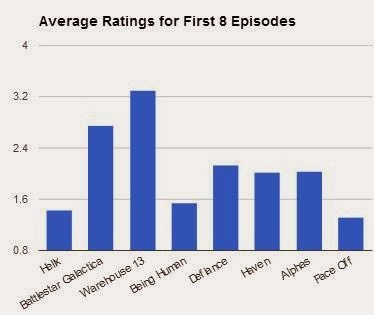 Alphas only lasted two seasons with relatively higher numbers than Helix before it got canned. With the finale of Helix’s inaugural season at the end of the month, a renewal seems unlikely. 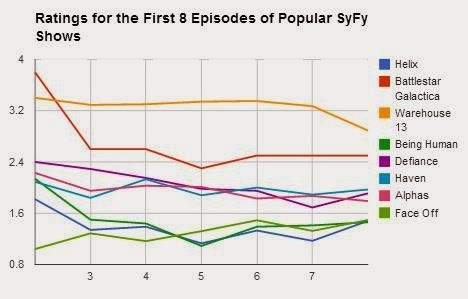 Other SyFy programs that didn’t maintain solid ratings didn’t last very long. It seems that even the heavy mentioning of the show’s association with Ronald D. Moore in its marketing campaigns wasn’t enough to bring in enough viewers this time around. Chad Gingrich is a Syfy enthusiast and pop culture geek hosting a weekly podcast called “Epic Geek Out.” Chad writes on behalf of Dish Systems, a great source for the best Dish Network deals and promotions.